California has no mighty rivers like the Mississippi, but rivers of a different kind can flood the state. In winter 2017, more than a meter of precipitation fell in some places, unleashing floods, triggering landslides, and causing evacuation of 200,000 people. 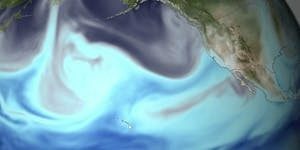 It’s all because of atmospheric rivers: long, narrow ribbons of water vapor rushing across the sky.